I have come bearing photos! I have not shared many since I joined last year. I got Sasha at 12 weeks last June. She has been a lot of work, but all worth it. I love her so much! She has clipped non standing ears, please don't judge. 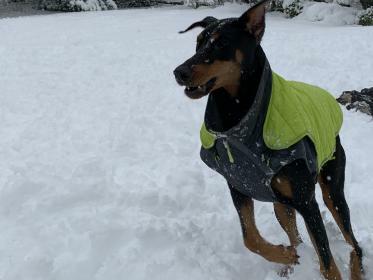 We were not good at posting since, she is our first and didn't really know how to do it well, and I couldn't handle all the judgmental stares from the people where I live. 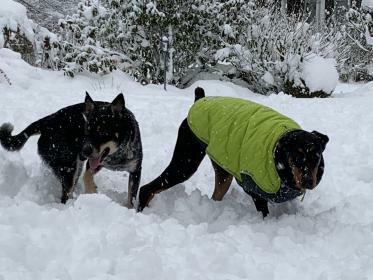 I still think she is adorable.This is her playing with her Blue Heeler beau from next door in the crazy amount of snow we had in the Seattle area in February. My Hoss carrys his right ear in a funny way when he is relaxed......your dog looks absolutely perfect. Stay with us.......love to hear more about your adventures. 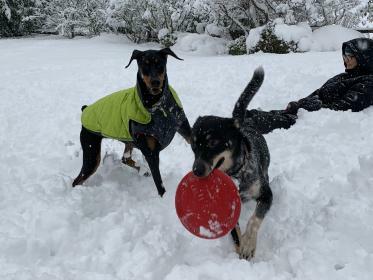 Great pics....they look like they're having fun in all that snow!! 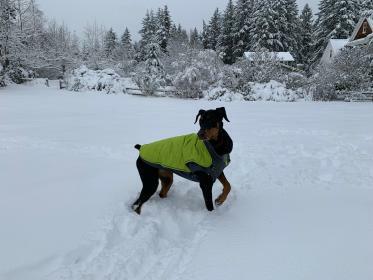 Yeah Seattle got hammered this winter. we avoided much of it down here in Portland . Ears... Meh. Ears do not make the dog. Our senior has a true "Military" crop (actually a re-crop). Most often, I just say thanks. Other times I put him at attention and await a reaction. Again... Thanks for the photos. Don't be such a stranger! Enjoyed the photos - thx. Beautiful girl! She looks like she's having the time of her life in those pictures!